We Are Your Local Family-Owned Feed Store! Share "Pet Dangers During the Holiday Season"
The holiday season is a stressful, hectic time, but it can also be a downright dangerous season for pets. Being aware of the hidden dangers that lurk in everything from holiday food and decorations to family visits is essential for all pet owners to safeguard their furred, feathered and scaled family members. Many holiday things we enjoy – special foods and feasts, enchanting decorations, twinkling lights, gifts, visits from family and friends – can actually be dangerous to pets. Fortunately, avoiding these dangers is easy once we understand the potential risks. Delicious treats are part of any holiday. Not only do we often have special treats out for snacking, but we might even prepare a holiday meal plate to share with our pets. Many holiday ingredients, however, are toxic to animals. The onions in stuffing, spices on a turkey, fat from ham, salt in gravy, chocolate in baked goods, raisins from fruitcake, many types of nuts and any alcohol – all are harmful to pets and even small amounts can be dangerous. Protect Your Pets: Keep holiday foods out of reach of pets, including accomplished counter-surfers, and never feed your pet from the table. Provide only pet-friendly treats, and be sure pets cannot get into trash or leftovers. From Christmas trees to poinsettias, Christmas cactuses, holly, lilies, amaryllis and mistletoe, plants are part of holiday decorations and can be lovely additions to home décor to celebrate the season. These same plants, however, are toxic to pets and can be dangerous if pets ingest leaves, berries or needles. Not only can oils in the plants cause dangerous reactions, but sharp leaves or needles might cause internal irritations, cuts or punctures that can be life-threatening. Protect Your Pets: Keep plants out of reach of pets or opt for artificial plants that won't have the toxic affects if pets do come into contact with them. Glittery decorations on trees, packages and mantles is beautiful during the holidays, but tinsel, garland and ribbons aren't beautiful to pets. These items can be choking hazards, and can cause intestinal blockages if ingested. Wire-edged decorations can also be sharp hazards if pets nibble on them, causing cuts to the mouth and gums or internal injuries if bits of wire are swallowed. Protect Your Pets: Do not play with garland or tinsel decorations, and keep dangling ends or swags well out of pet's reach. Do not use ribbons or tinsel as festive collars, and instead buy a pet-safe holiday collar if you want your pet wearing seasonal gear. From twinkling light strands to inflatable lawn décor to air mattresses for visitors, our homes can be strewn with plugs and cords during the holidays. Pets that chew or tug on these tempting items may suffer from tangle injuries, choking or even shocks or burns if cords short circuit. Stay Safe: Keep cords neatly wrapped so pets can't reach them, or put cords under rugs or other barriers out of reach. Unplug cords when not in use or when you won't be home, and check regularly for cord damage or frayed wires to ensure wiring stays safe. Ornaments are stunning holiday decorations whether they are hung on trees, displayed in bowls, draped in garlands or wound into wreaths. Unfortunately, pets may see them as irresistible treats, and broken glass or sharp plastic from shattered ornaments can cause severe cuts and internal injuries to pets. Stay Safe: Train animals to keep away from trees and other decorations, and opt for shatterproof ornaments whenever possible. Position delicate ornaments well out of a pet's reach, or keep pets out of the room with the decorated tree entirely. Candles on menorahs, mantles or centerpieces are delightful decorations. A a flame's flicker, however, can be tempting for playful pets, and fire is a real hazard to fur and skin. Furthermore, scented candles are infused with oils that, while delicious to smell, can be toxic if pets accidentally ingest them. Stay Safe: Opt for flameless battery-powered candles instead of real flames, and never leave candles burning unattended. Be sure there are no flammable materials near any lit candle to avoid the risk of fire. Many people celebrate with exuberant fireworks, but loud noises and explosions can frighten pets. If pets are nearby when fireworks are used, they may also be at risk for burns from smoldering rockets or out-of-control launches. Leftover bits of burned wrappers and gunpowder are also toxic to pets. Stay Safe: Keep pets indoors when fireworks are used, and follow all safely precautions when lighting fireworks. Clean up all debris when it is cooled and dispose of it out of reach of pets. Visits from friends and family are a wonderful part of the holidays, but extra guests can disorient pets, especially when new visitors use unfamiliar commands or treat pets differently. Children may not know how to safely interact with pets, or overnight visitors may accidentally leave medication or other unsafe items accessible to pets, leading to numerous problems. Stay Safe: Introduce guests to pets properly, and let them know what commands or house rules are necessary for pets' safety. Be sure pets have a safe, calm space to retreat if needed, such as a comfortable crate or room where guests don't visit. It's unfortunate that the holidays can be so filled with extra chores, tasks and events that we may not spend as much time with our pets as we normally do. This can lead to accidentally missed meals, fewer walks or playtime sessions or other inadvertent neglect that can cause stress or other problems for pets. Stay Safe: Make time each day for your pets. If necessary, assign different pet care chores to different family members so everyone pitches in to help be sure a pet gets the proper care throughout the holiday season. With so much coming and going during the holidays, it's easy for a clever pet to slip out of a door or gate unnoticed. This can lead to many dangers, including being lost, hit by a vehicle, encountering predators, cold exposure, coming across toxic chemicals and more. Stay Safe: Take extra care to watch pets near any escape points, and be sure they are always wearing collars and identification tags. Get your pet microchipped so you can be reunited if they do become lost. 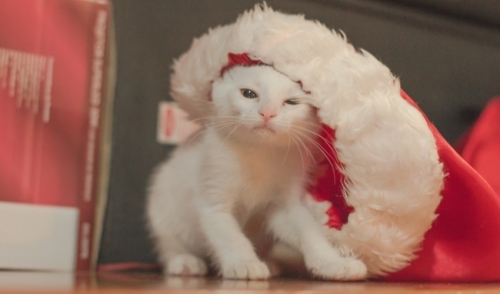 The holidays are a great time, but also a dangerous time for pets. By being aware of the top pet dangers during the holiday season, however, owners can take all the necessary steps to keep their pets safe, comfortable and happy during every holiday celebration. © 2019 Powell Feed & Milling Company, Inc.. All rights reserved.